Over the river and through the woods to Savannah, Georgia we go! 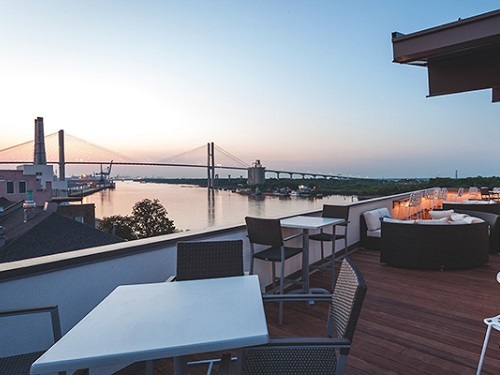 Just over the state line is the beautiful and historical town of Savannah, GA, aka the perfect day trip from Hilton Head Island. Spend the entire day walking around Savannah’s Historic District squares, perusing museums, and (best of all) eating your favorite southern dishes! The city of Savannah dates back to 1733. Within Savannah Historic District, there are 22 breathtaking squares with historical plaques and statues to honor the men who built and fought during the Revolutionary War and the Civil War for the city. Personally, I like to stop for a coffee and walk as many squares as I can (before my stomach begins to growl), taking time to read each historical sign and monument. Following each square will wind you through the streets until you pop out towards the riverfront. 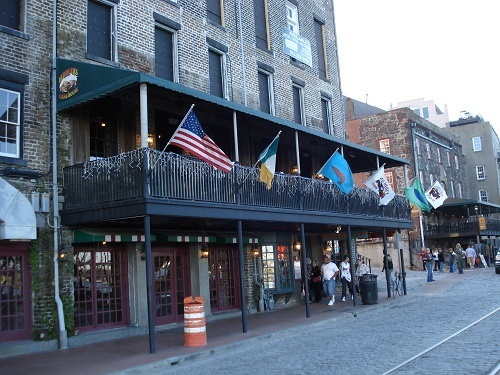 The Savannah Riverfront (known as River Street) is full of little shops, candy stores, and delicious restaurants! Stomach telling you it’s time for food? Take a break at one of my favorite brunch spots: Huey’s! Huey’s overlooks the water and all of River Street. In the summer, they open all the windows so that you can relax in the beautiful breeze. Not sold yet? 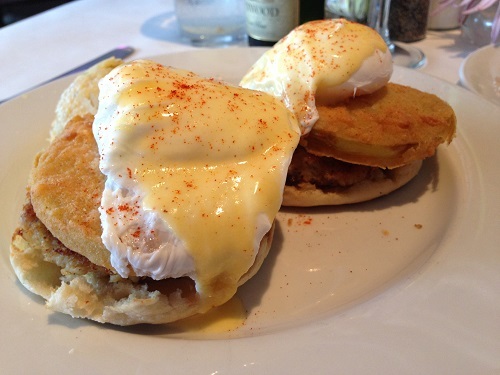 Two words: Crabcake Benedict. Yes, you heard me correctly! It’s a delicious blend of poached eggs, crab cakes and fried green tomatoes on a toasted English muffin with hollandaise sauce. One of the newest additions to City Market just might be my new favorite museum in all of Savannah! After spending a few hours in City Market wandering the museum and the surrounding shops, I think it’s time for lunch! My favorite lunch spot is Pirate’s House. The building itself is said to be the oldest building in all of Georgia. 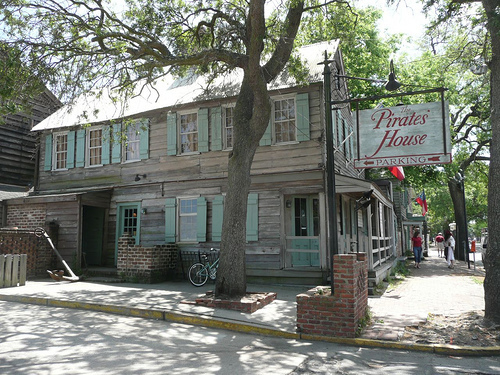 Since 1753, The Pirate’s House has been welcoming visitors to Savannah with a bounty of delicious food and drink and rousing good times. It first opened as an inn for seafarers, and fast became a rendezvous for blood-thirsty pirates. The restaurant and inn are also home to a haunted underground tunnel. You can peruse the interior of the restaurant to see the tunnel that is said to lead from the Rum Cellar in the basement of The Pirates’ House to River Street. One of the most intriguing stories is the story of people shanghaied through the tunnels. Men would drink at the bar, get drunk, pass out and wake up on a ship a few miles off of shore. They were forced into the harsh life of a pirate. Today, the tunnel is filled in but it’s open to the public as an exhibit. There is also a neat gift shop upstairs! Enjoy the afternoon touring the city in a comfy, horse-drawn carriage! Not only does this give a more personalized touch, but the sights are also beautiful. You really can’t more than a block without seeing a horse and carriage; it’s finding an empty carriage to hop aboard that’s a little more difficult. 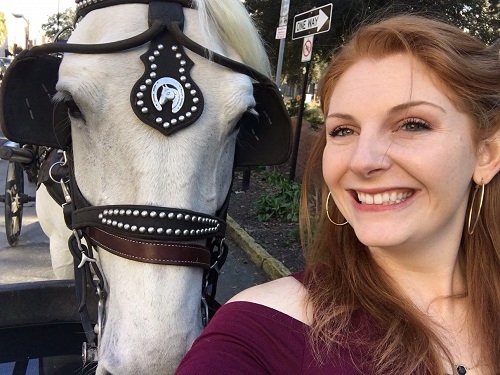 I was fortunate enough to find Annie, a beautiful white horse and her owner, Katie! They work for Plantation Carriage Rides. She asked which type of tour I was interested in, and I asked her to point out her favorite spots and unique stories. With a funny grin, that said she knew exactly where to take us, we were off! There were so many neat stories about the Revolutionary War, the Civil War, and the overall history of Savannah. If you are a history buff like me, you will not be disappointed with this unique personal tour! Also, I am a little afraid of horses, but Annie was so calm and sweet it made the experience even more memorable! Aside from the rich history, Savannah is also known for booze and boos! If you’re looking for a 21 and older ghost tour, pick a company that does half haunted history, half bar crawl. This way you get a little knowledge with your libations! There are a hundred different companies offering similar tours, don’t be afraid to do a little research before choosing one. After your haunted ghost tour, it’s time for… more food! Finish off your day trip with a delectable dinner at Fiddler’s Crab House! With a front-row seat to Savannah’s historic cobblestones, Fiddlers’ serves up some of the freshest available locally caught seafood on River Street! Housed in a historic 1850′s cotton warehouse, they offer a complete lunch and dinner menus and have a well-stocked bar. With signature crab cakes, shellfish platters, hand-shucked oysters and a wide variety of steamed and fried seafood, they are devoted to delighting the seafood lover in you. For the first time ever, I tried a RAW (and slimy) oyster. I may have plugged my nose for the first one, but I ended up going back for more. Oysters are actually pretty good! I also got the Lowcountry boil, which is one of my favorite southern dishes! There’s crab, shrimp, crawfish, potatoes, corn, sausage, and green beans to satisfy your southern cooking cravings! Absolutely delicious! In the evening, if you’re up for one more stop before heading back to the car, I suggest heading over to the Cotton Sail Rooftop Bar. 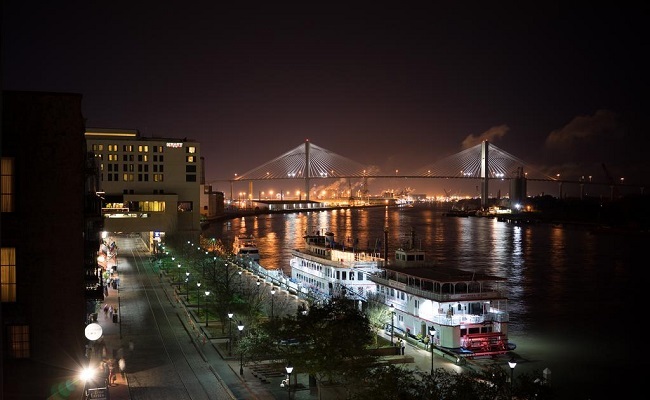 The view of the lit Savannah Bridge is worth the jaunt over there. Then you can head back to the car and back to your vacation home for a long good night’s rest! You’ll definitely be tired after hitting all of these awesome stops in your day trip from Hilton Head Island to Savannah, Georgia! Parking info: Most street parking is lifted on the weekends; however, I park at the Bryan Public Parking garage for $5.00 a day. Drinking info: Savannah has open container laws that allow the public to carry a specific sized to go cup with alcoholic beverages. 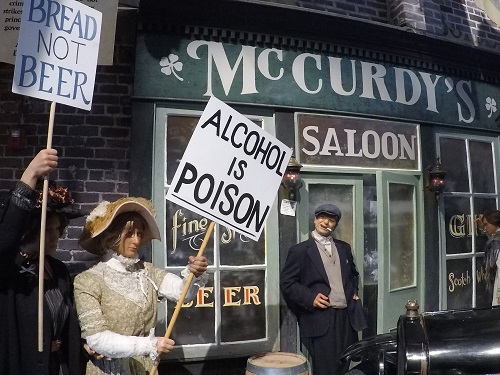 With that said, please drink responsibly. Do not drink and drive. Please note if you are visiting Savannah on Sundays, alcohol is not served until 12:30 p.m. at restaurants only; bars will not be open on Sundays (with the exception of St. Patrick’s Day). Follow Spinnaker Resorts on Facebook, Instagram, and Pinterest for more travel tips and trips!